Singing is such a wonderful outlet for creativity and community...which is what RPL is all about! We are so happy to introduce two opportunities for Homeschool Families to sing! RSVP to Marney if you are interested! Love to sing? Want to serve? 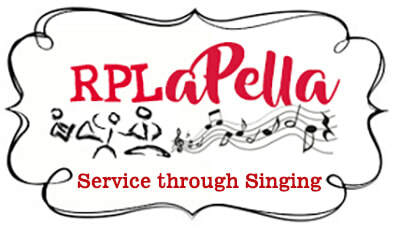 RPL aPella is a our"Service through Singing" group for homeschoolers -- kids and parents alike! We Will be meeting weekly, alternating between rehearsing songs and performing for different groups in the CC Young residents as part of our inter-generational partnership. We will have the opportunity to sing for a variety of audiences, from independent living, to full-time nursing care of various levels. This is an invaluable experience for children! We will meet on Fridays, 2:30-3:30. On Friday Feb 15 we are singing some Old Fashioned love songs for the Memory Day Care activity room. Come join us to sing or visit with the residents! We will send you a playlist to list to if you can come, just let us know! You don't have to attend every time, but be sure to let us know when you are planning to attend one of the volunteer/performance days. Kids/parents who don't want to sing can also volunteer by visiting with the residents, making artwork to share with them serving refreshments, etc. The vision of RPL aPella is to create an ongoing group in which families can sing together in a relaxed and fun setting, as we give something back by sharing the gift of music with residents at CC Young. * This group is recommended for children 7+ and their parents. If you have a homeschooling child younger than 7 interested in participating, please contact Marney to discuss. * Participation is free to RPL Members. If you are not a current member, please contact Marney to discuss options. * Parents do not have to participate alongside their kids, but we hope you will! We are designing this to be a fun activity that you can do as a family, and enjoy it all the more. * Previous singing experience - for parents or adults - is not required at all! If you're motivated to learn and have some fun, you are welcome! * Parents with younger kids: if there is enough interest ,perhaps we can have a revolving schedule to trade-off supervising Littles during rehearsals. * Attending weekly is encouraged if at all possible, for continuity for everyone concerned. * The weekly meeting time is conveniently scheduled right before rehearsals for ":WHIRLD!" - with a 30 minute break before rehearsal starts. If your child is auditioning for WHIRLD! we will arrange your rehearsals on Fridays to keep your calendar simple as possible! * Note that we will be moving toward performing for CC Young residents twice a month, as part of our inter-generational partnership. These will be casual performances, primarily for those in Assisted Living and Memory Care. These performances will also be times where anyone - child or adult - can perform any song or musical instrument, which is a valuable opportunity to get more comfortable with performing. Further questions? Email us here!